The willing suspension of disbelief is a fundamental requirement when you visit the Disney Parks. If you are going to get the most out of your visit then cynicism has to be left at the gates. One of the most charming elements of any day at the parks is the opportunity to meet the characters. Naturally any adult will be quite well aware that they are consorting with a man in a fur suit but somehow that matters little as you are meeting Pluto for heaven’s sake! Character meetings are wonderful but what if you actually know the man who is the suit? One of my friends is something of a professional when it comes to our best loved characters. He has worked at several parks including Disneyland Paris and has appeared as Pluto, Goofy and a variety of other fury friends. I often wondered what it would be like to see him in action and then I got my chance when I visited Paris recently. 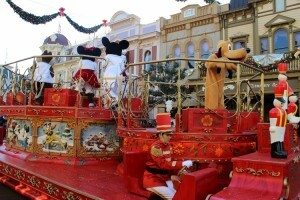 On my first day at Disneyland Paris I visited the Studios on the first day and arrived just in time to see the parade. As the floats and characters passed through the street my attention was caught by goofy who seemed to have a rather familiar walk. I became convinced that I had just seen my friend in action but I couldn’t be sure until I called him later and my suspicions were confirmed. The following day I entered the Disneyland Park full of expectation. It was the build-up to Christmas and there was extra magic in the air. There was also an extra parade and I made a point of grabbing a good position on the curb of Main Street. As the parade made its way down the street I could see my friend dancing away. His section of the convoy soon passed by me and it was a cornucopia of costumes and floats with lovely Christmas trees and decorations. My friend broke ranks and ran over to me pulling faces and waving. It probably sounds silly but it was a special moment and I felt a bit like a VIP! Later that same day I was riding Dumbo (well it had to be done!) when I heard a voice calling my name. My friend, dressed in civvies, was standing below waving at me. We met up after my ride and he escorted me around the park. I got to meet one of the Disney princesses because he knew the actor and I was having a wonderful time. The highlight was the main parade. I was standing next to my friend and several of the characters saw him and came over to us treating us both to a personal performance. I now felt even more like a VIP. It turned out that knowing the actor behind the costume did not detract from the magic and indeed only served to enhance it. I had a brilliant trip and was delighted to discover that my friend was to spend the summer at Chessington World of Adventures performing in the Madagascar show. Naturally I paid him a visit and was delighted to be knocked over by Alex the lion and to be invited for pictures with all of the characters. Special times indeed! This entry was posted in Stories and tagged chessington, disney, disney parade, disneyland paris, pluto, theme parks on February 28, 2014 by Sally.